Note: Review was conducted on a PS4 Pro using a 4K TV. The air is thick with anticipation. 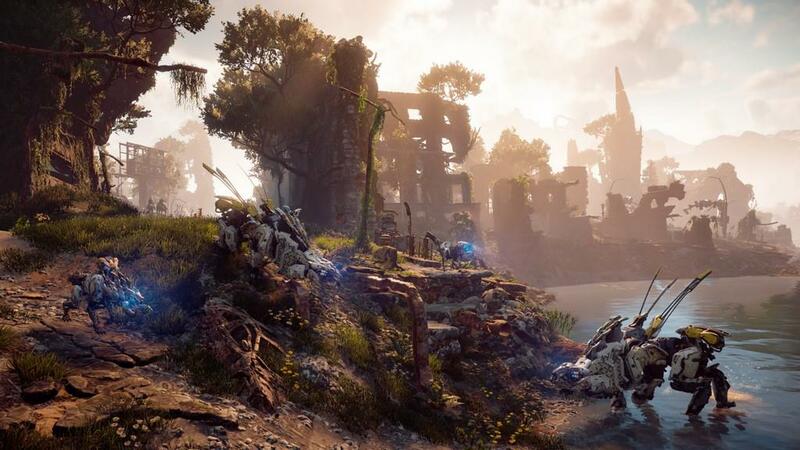 The hunt is on, and the Thunderjaw is going down. Best to set up some Tripcaster lines and hope they damage this massive beast that is one part machine, one part dinosaur, and all parts terrifying. I encountered this machine in the wild, shortly after a mission that had already depleted me of a good amount of resources and ammo. But I think I’ve got this. Aloy’s kicking around a few thoughts in her head as well, impeccably voiced by Ashly Burch. An arrow is nocked, one of the Tearblast arrows that’s great for stripping armor off these machines. I let it fly, and 10 minutes later, after a harrowing battle, I emerge victorious. My prize is numerous metal shards, along with a few weapon and armor modifications. Aloy’s excitement is palpable. A few days ago she was merely an outcast of the Nora tribe, and now she’s gone further than any other Nora, and has seen a world worth fighting for. 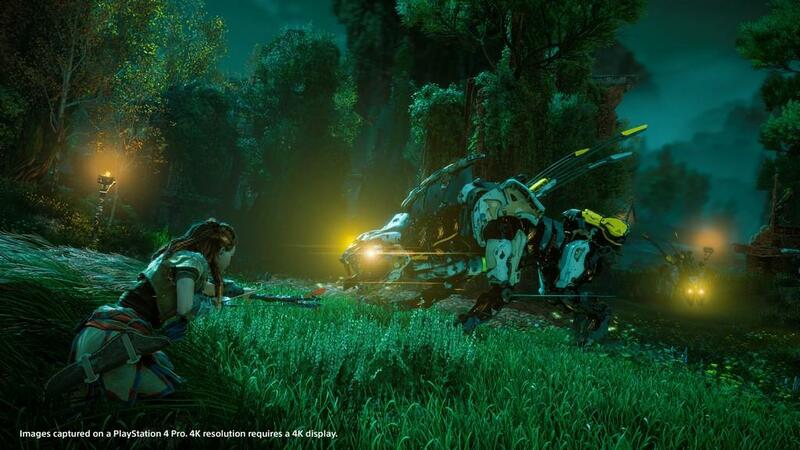 This is Horizon: Zero Dawn, one of the finest games of this generation. Guerrilla Games is best known for their Killzone franchise, capable of amazing visuals, but up to this point had only released first-person shooters. And now they’ve released this open world opus that liberally takes the best features of its peers, and deftly executes on all fronts. I got twinges of Tomb Raider, Assassin’s Creed, Monster Hunter, and Far Cry as I played this game, but with none of the frustration, and all of the enjoyment. 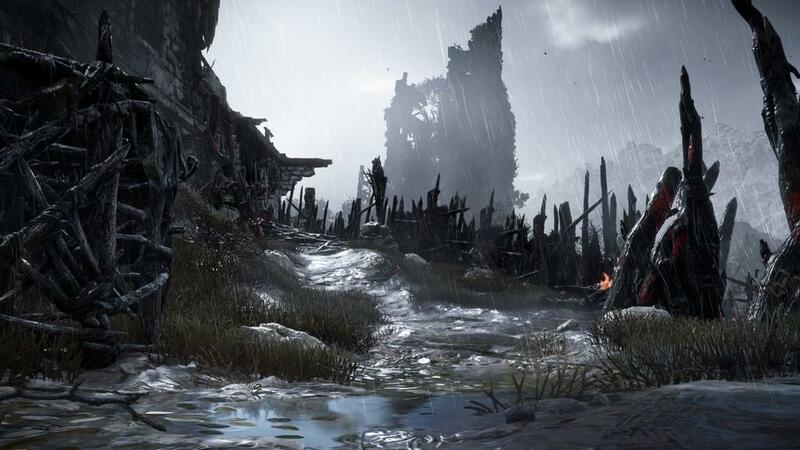 This giant sandbox that Guerilla has crafted for Aloy (and by extension, the player) is executed with a level of restraint, to dial back all the open world nonsense when necessary, but at the same time provide an ample level of distraction from the story, and you’ll notice that not minutes, but hours have gone by. And through it all, I was satisfied. By the end of the credits I had logged 27 hours, and had nearly 60 percent of the game completed. But for me, it’s not enough. There’s something driving me to play this game to absolute completion. Which is a rare feat in an open world game these days. What really took hold of me in Horizon: Zero Dawn was the combat. Aloy had spent years of her life training to run The Proving, which would allow her to rejoin the Nora tribe, after being cast out at birth. Her formative years were spent learning to hunt and care for herself, raised by her guardian, Rost, and he instilled within her the skills necessary to hunt the machines that now inhabit the Earth. Her "Focus" gives her many abilities beyond the normal hunters. She can see patrol routes, spot weaknesses, and has (your) steady hands to put down enemies without even being seen. She also gains the ability to hack enemies to get them to fight for her, or give her a ride if necessary. And given how large the world is, I’m glad that this is available. Each enemy, and subsequently, each fight, more or less plays out the same, but at the same time, each encounter feels unique. What worked against a Stormbird might be total overkill for a Watcher, and humans fall much easier than the machines, so the options for taking them out can be a little more direct if need be, I could hide in the bushes, call them over for a quick stealth kill, or a I could do damage from a distance, with arrows doing my dirty work. The spread of weapons also feels like they could fit any play style. 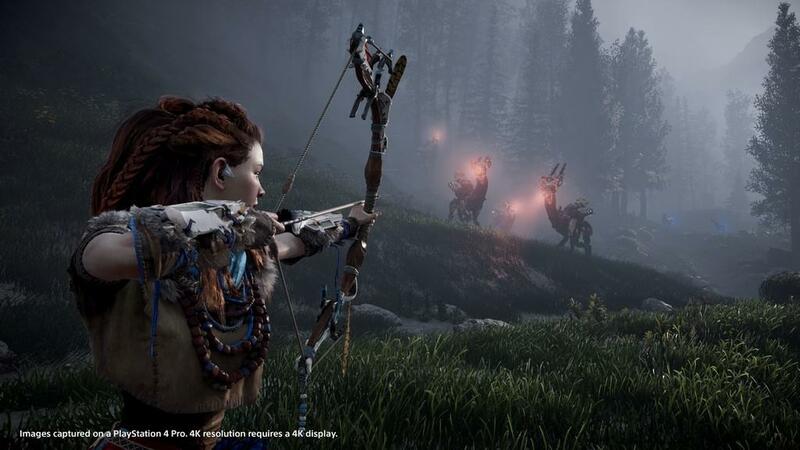 You’ve got bows that specialize in sniping, grenade launchers that do massive area damage or status effects, rapid fire weapons for when accuracy doesn’t matter (especially against larger creatures), or melee weapons that come in handy in a close quarters pinch. What’s important is that each one of these weapons feels fun, all of them feel powerful to a certain degree, and ultimately all of them are useful. Like I said before, Aloy is an outcast of the Nora tribe, her crime? Her very birth. The Nora quickly cast her out, and want nothing to do with her, and during the tutorial portion of the game, this fact hits home quite often, and hard. The cruelty of the Nora tribe is not lost, and seeing the gears in little Aloy’s head churn and process this, help form her into the cynical yet still naive youth that you ultimately explore the world as. Aloy’s journey is one of self-discovery, and she’s incredibly well-animated. 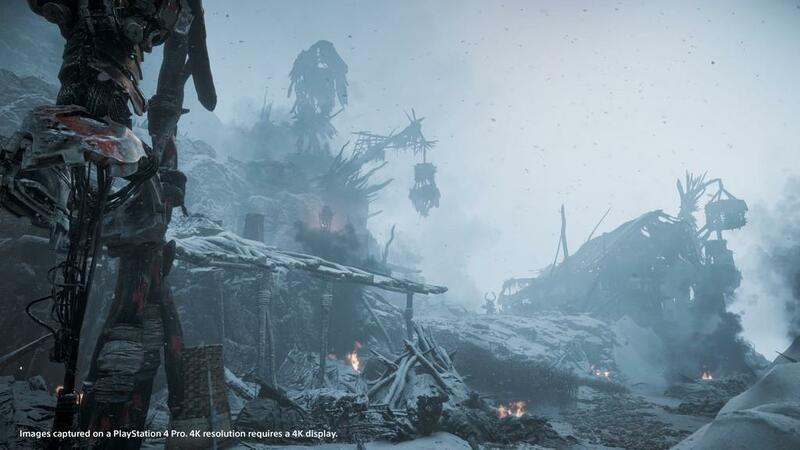 During the tutorial, the six-year-old Aloy skips along as she follows Rost, is genuinely curious about the world and, like any child, believes she can do almost anything. The motion capture and animation easily gives someone like Andy Serkis a run for his money. It’s a shame that I can’t say the same for a lot of the ancillary characters. There seems to be a bit too much facial animation at times, and it makes for some uncanny valley moments. But the character models are astounding, and this is the first time where a console game has delivered on the promise of AAA 4K gaming. 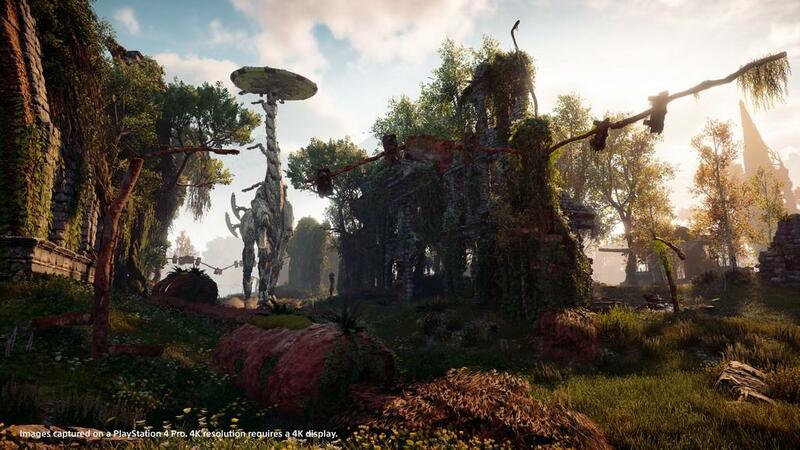 While Rez is astonishing in its own right, it not fair to try and compare it to the visual marvel that is Horizon: Zero Dawn. The landscape is littered with scenic points on a moment to moment basis. Whether it’s running through dilapidated buildings, lush forests, high deserts, or snow-filled valleys, this game has a plethora of spots to take that perfect photo. I rarely want to take screenshots of games, but I had one that I just had to capture, with the sun setting over the hills to cast a warm red glow on the snow and trees surrounding me. Tell me that’s not beautiful (actually I totally expect that because this is the internet). 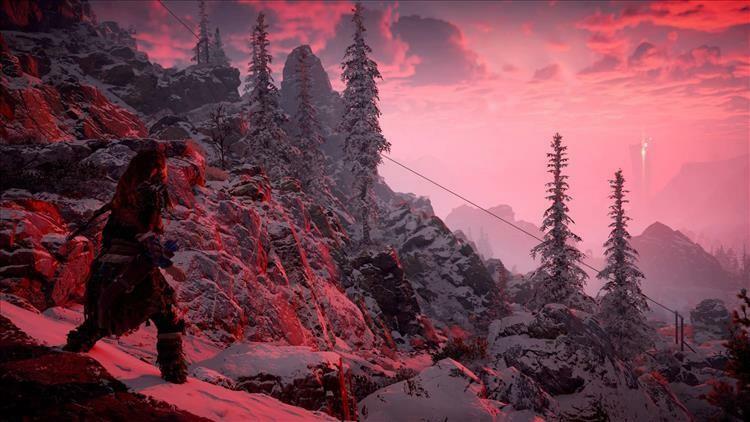 What I’m saying, though, is that visually stunning moments are a regular occurrence in Horizon: Zero Dawn. Sometimes it’s nice to just soak them in. The HDR lighting casts some really heavy colors and, as a whole, this game is vibrant. For a world that’s cast humans aside, it’s doing alright for itself. And to further immerse yourself, set the HUD to dynamic. While it's a helpful HUD, it can crowd the screen at times. The lite soundtrack never interferes with the game, and has a wide variety of tunes that fit in each moment. The machines and animals have great audio effects to match their movements and personalities, so it’s weird that so much of the voice acting seems phoned in. There are some characters that are decent, and others that are just flat out…flat. Like I said earlier, Ashly Burch has done a phenomenal job as Aloy, and it’s too bad she’s surrounded by characters that sometimes come off as awkward at best, and bland at worst. I have other incredibly minor hang-ups about Horizon: Zero Dawn as well. For one, the hidden items that you collect throughout the world don’t have a particularly good payoff for finding them. In fact, this game loves random loot, and I’m almost shocked there’s no micro-transactions to go along with it. You can blow plenty of in-game cash on items of chance, but to not receive random loot as a reward for collecting X amount of Y, is kind of a let down. The other thing that actually feels like a pretty severe oversight is the inability to buy things in bulk. For the way I choose to play, I use a lot of ammo that requires wires, and I'm constantly running out while crafting ammo. And not being able to buy a stack of them was utterly silly to me. I can sell items to merchants in bulk, but I can’t buy them? Please, Guerrilla Games, patch that functionality in. Horizon: Zero Dawn to me, has justified my purchase of a PS4 Pro and a 4K TV. This is the game that shows what 4K gaming on a console is capable of. And while PC people may scoff, I say, soak it in, because this game is absolutely beautiful. It plays like a dream, and I’m honestly considering putting The Legend of Zelda: Breath of the Wild on hold until I have a platinum trophy for this game. I haven’t played an open world game to such levels of completion since Skyrim, nor have I had the desire to until now. For this game has managed to strike that perfect balance of exploration, dungeon crawling, and combat, and wrapped into one of the most visually astonishing titles of a generation. There may be some slight blemishes here and there, but they are easily overlooked, because the rest of the adventure is that good. Bravo, Guerrilla Games, this is one hell of an adventure. I got on the hype train early for this one, and I must say that Guerrilla Games delivers a nearly flawless gem of a game. 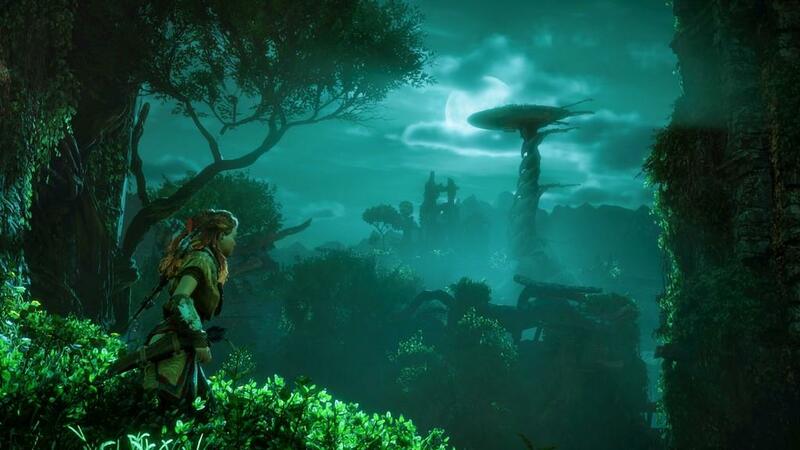 Horizon: Zero Dawn is an exceptional title from start to finish and is an absolute must for any gamer, old or new.